Creating wow factor in your kitchen can stem from a single element in your overall design plan or become the inspiration for the entire room. When planning your dream kitchen design, choose the specific items that speak to you and make special note of them on your wish list. If you begin with a fantastic component or two like killer light fixtures, handmade cabinets, drop dead flooring or one-of-a-kind accessories, everything else in the space will fall into place. The gourmet and wine lover in your household will adore this spacious monochromatic kitchen decked out in a range of creamy neutrals. 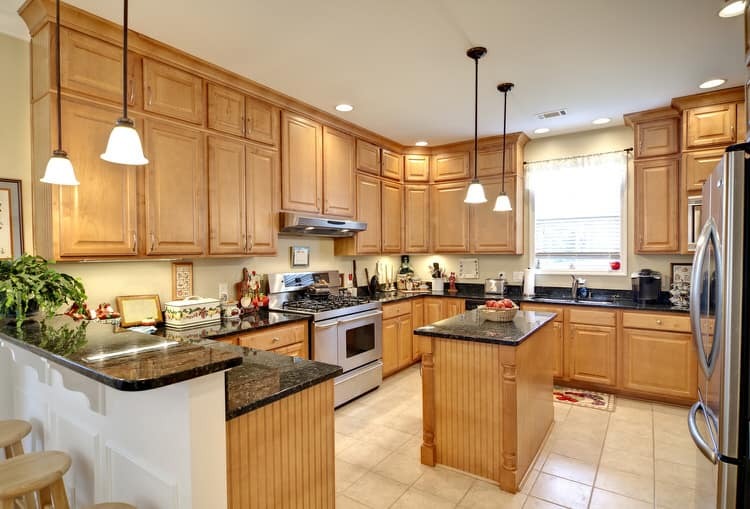 The space consists of two distinct zones divided by the center island—the food prep and storage areas. Take note of the custom cabinetry, contrasting pecan hardwood flooring and huge island fitted with a generous farmhouse sink, counter seating and wine cooling unit. Forget your high-tech media rooms and fancy boudoirs; this kitchen is definitely the heart of the home. The homeowners say the inspiration for this traditional design was the towering oak cabinetry with its quaint beadboard detail. Add glossy black pearl granite on the two-tiered breakfast bar and you have the perfect refuge from the outside world where your family can gather and reconnect. This kitchen is all about efficient layout. Gone are the days of the old work triangle consisting of the stove, fridge and sink. 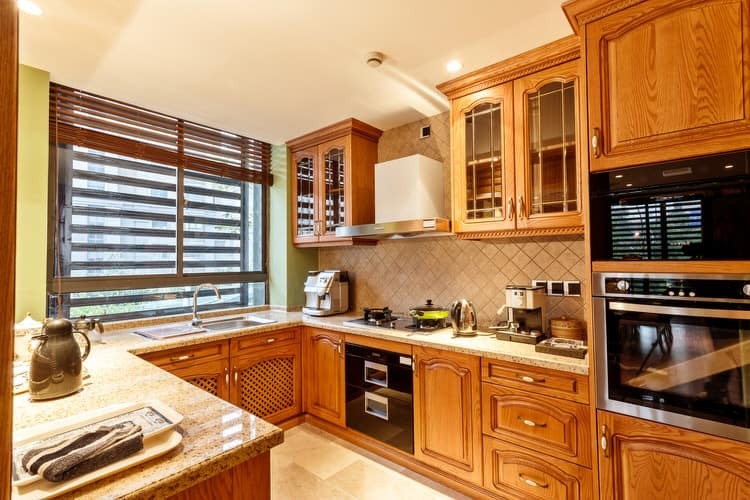 Now several work areas can live harmoniously in the same kitchen, making room for multiple cooks and improving traffic flow to accommodate family and friends. 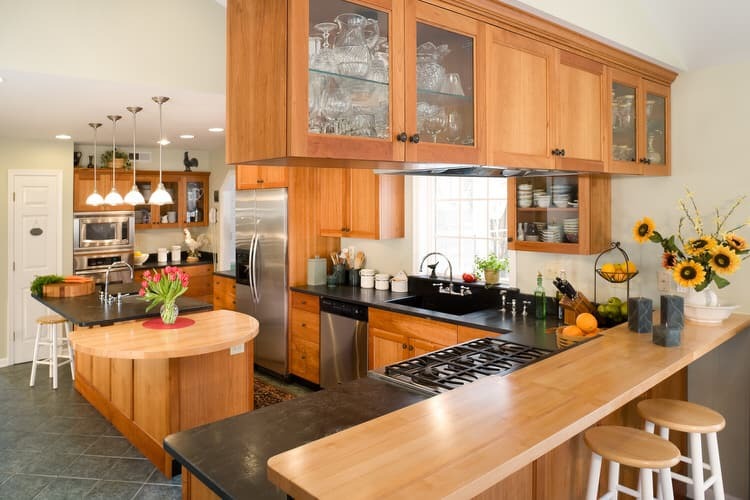 Custom solid wood cabinets and ornately carved range hood are front and center in this Old World kitchen. 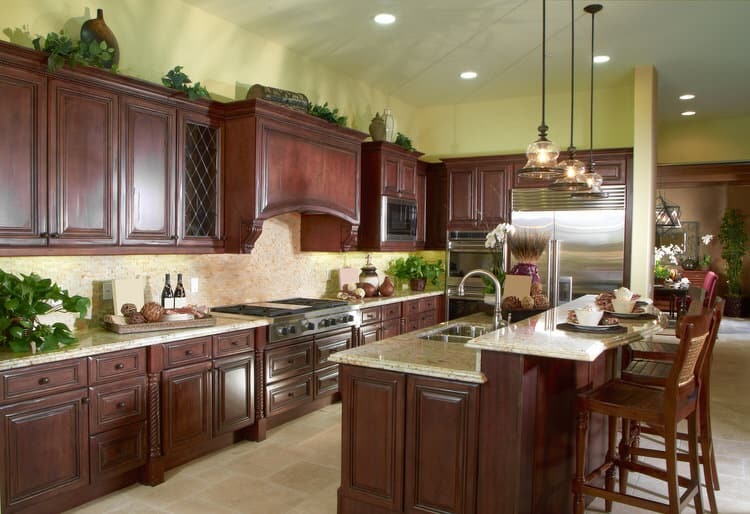 Quality, solid wood cabinets are quite pricey and can be one of the biggest expenditures in your kitchen. 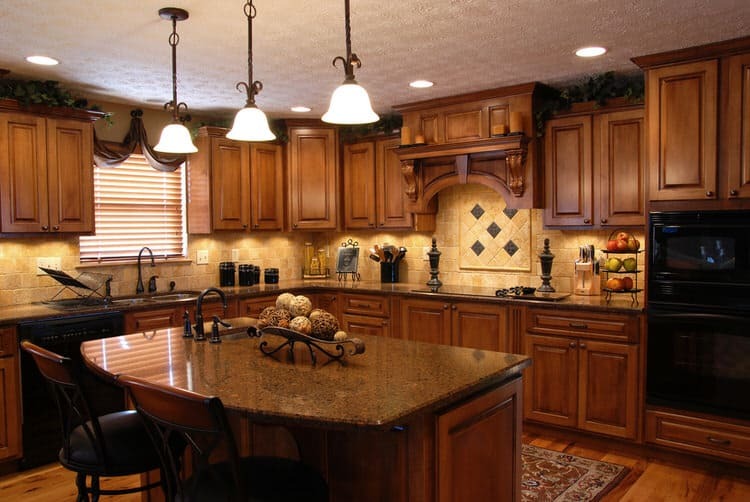 However, the investment is well worth it when you consider that cabinets are the foundation of beautiful kitchen design. Magical things happen in this wizard-inspired kitchen! It may not suit everyone’s taste, but for one homeowner it is the ultimate dream. 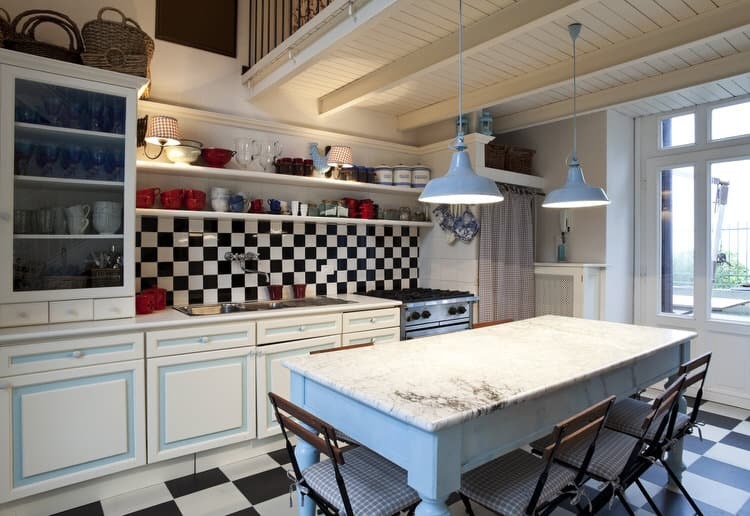 Black and white checks play a prominent role in the design—covering every inch floor and backsplash. An affinity for white marble is evident in the counters and table top. A combination of blue stain and cherry cabinet finishes adds to the quirky design. The imposing kitchen pictured here belongs to a chef/restaurant owner. 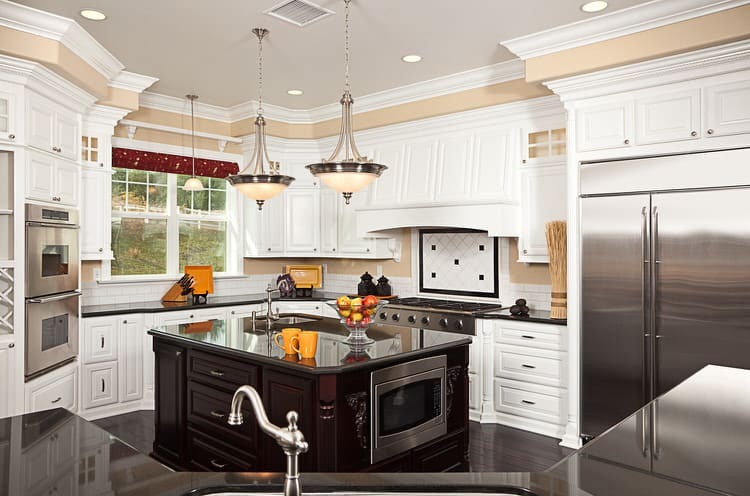 His dream was to recreate a commercial kitchen in his new custom estate home. In fact, he used many of the same commercial elements straight from his own dining establishment. 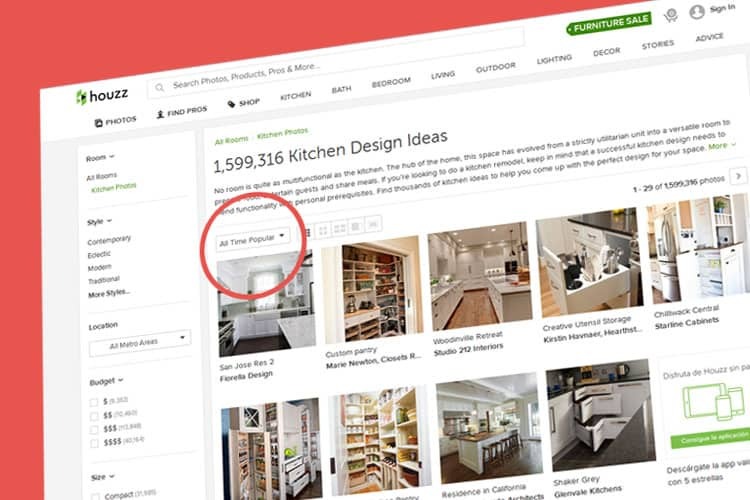 This way he can test and perfect recipes while relaxing at home. 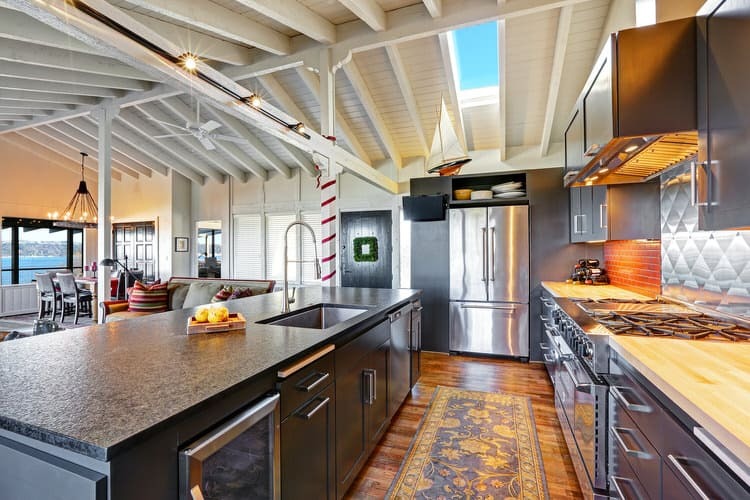 Our favorite feature is the range hood spanning the colossal work island. Impressive. Sage green walls and bright white cabinets open up the space in this renovated 1930s bungalow kitchen. The horizontal lines create harmony and balance, while the oversized artwork adds a welcome punch of red to the beautiful room. 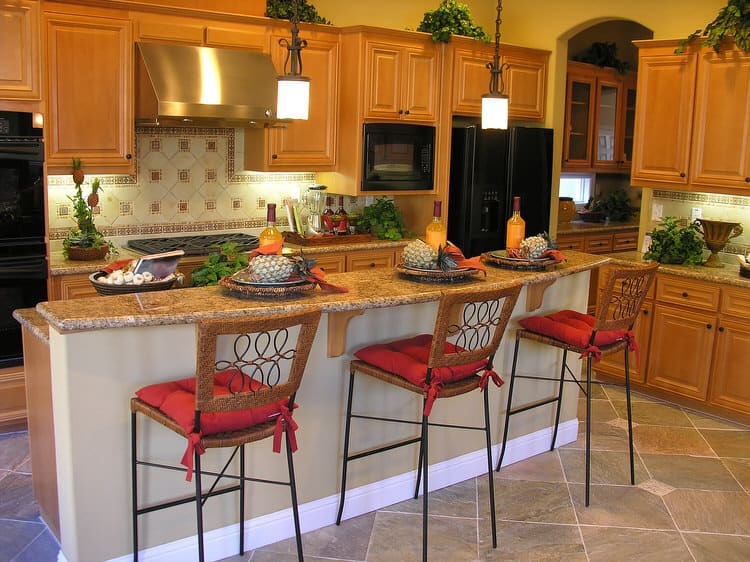 The choice of tile in a grand kitchen requires careful thought. The designer of this kitchen got it right. A mosaic glass tile feature behind the range floats beautifully amid the tumbled marble backsplash. The vertical tile surfaces provide the perfect backdrop for this formal, yet inviting kitchen. Also check out the flooring. 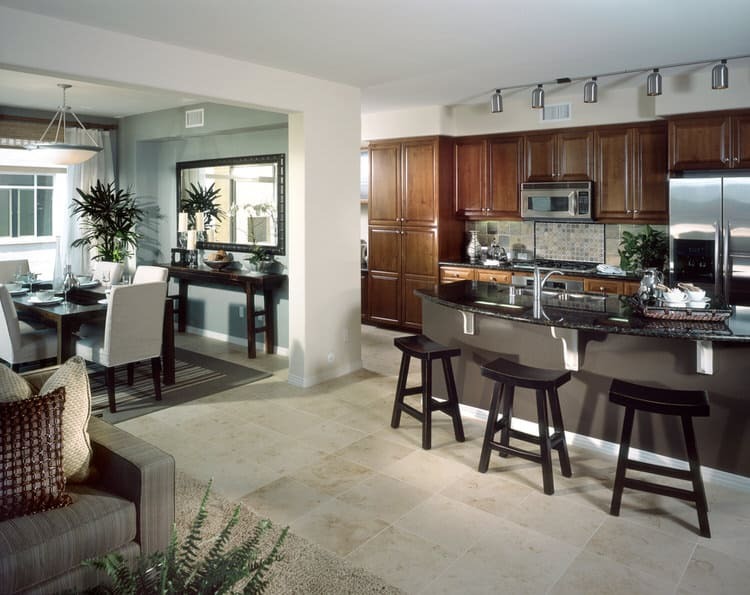 The large-scale travertine tile installed at an angle adds movement to the space and unites all of the tile accents. 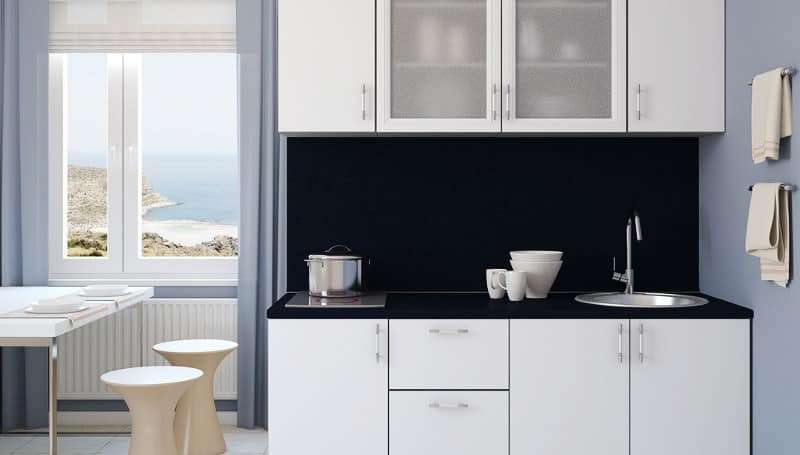 White cabinets are a fabulous backdrop for the black island and super dark flooring. The contrast takes the kitchen to whole new level of amazing. Yellow paint on the soffit and a deep red stagecoach valance above the double window provide just enough color to give the room a warm glow. A long kitchen can sometimes feel claustrophobic, but this one is certainly an exception. The pass-through above the sink and dishwasher give the appearance of a much wider space. Another room expanding effect is the steel blue dining nook and bay window off the end of the kitchen. 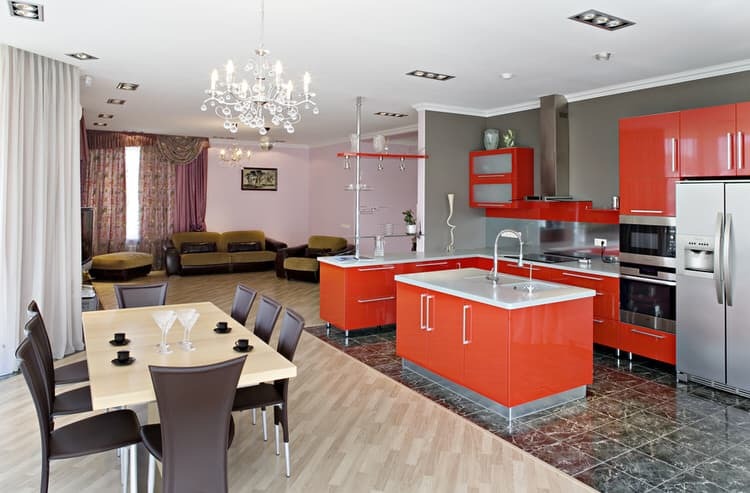 If you like warm, vibrant colors, get ready for this bold kitchen. The effect starts underfoot with red stained hardwood. 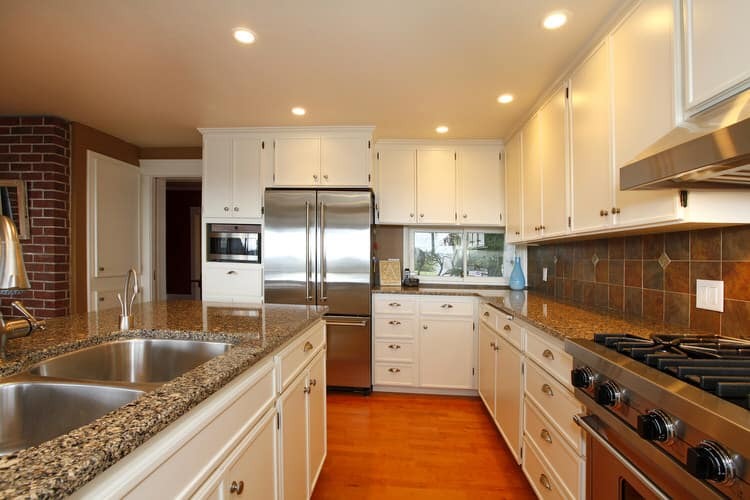 Moving up, we see wood cabinets with an almost orange tint. Don’t worry that the wood tones don’t quite match—their warm tones complement one another, making it all good from a design point of view. The look comes full circle with bright red paint on the soffit and into the adjoining living space. 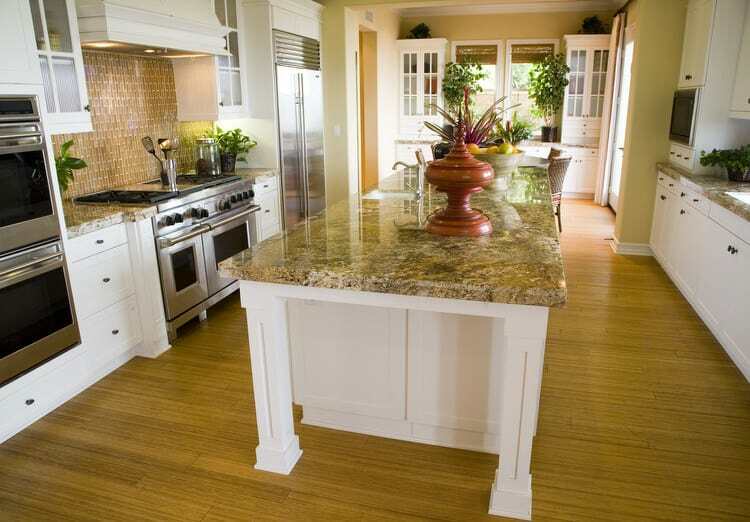 We can’t take our eyes off this multi-level island with its two-toned counter. The design is custom and a real conversation starter. We’re told this custom piece was the inspiration for the rest of the kitchen. The pale celery wall color mimics the deep tones in the natural slate flooring. Black soapstone and light wood countertops pick up where the island leaves off, bringing the design to a beautiful completion. 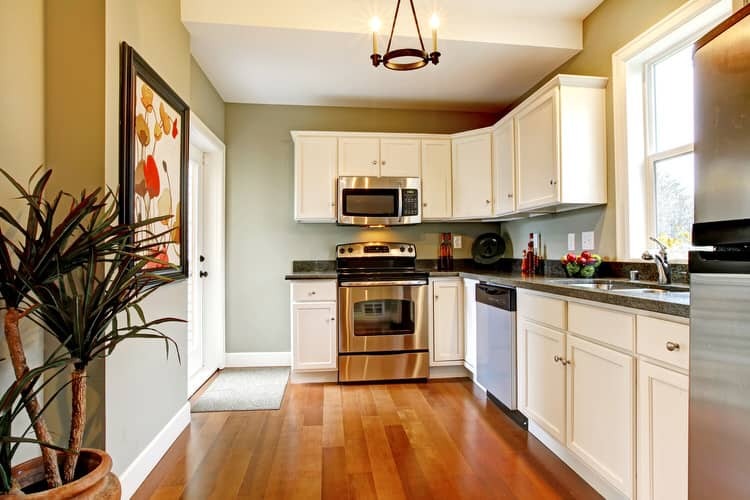 Some think oak kitchen cabinets and flooring impart a cozy, traditional feel. Others think of maple as quite passé. 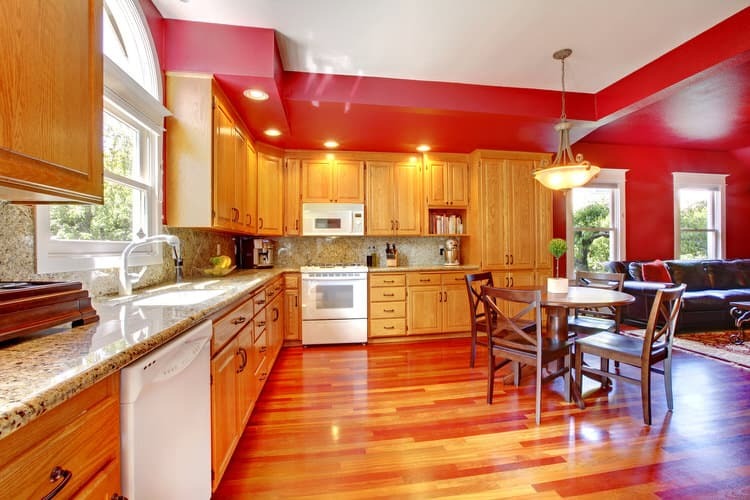 In this particular kitchen, the owners totally understand how to use this wood tone successfully. It helped to keep the cabinets simple with traditional lines. The contemporary counter stools, ebony countertops and black refrigerator really pop against the light oak. In this kitchen, stainless steel is the consistent element that allows you to bring in a variety of colors and textures. The double sink, commercial range and refrigerator act as design glue to bind the white cabinets, wood flooring, multi-toned granite and tile backsplash together. 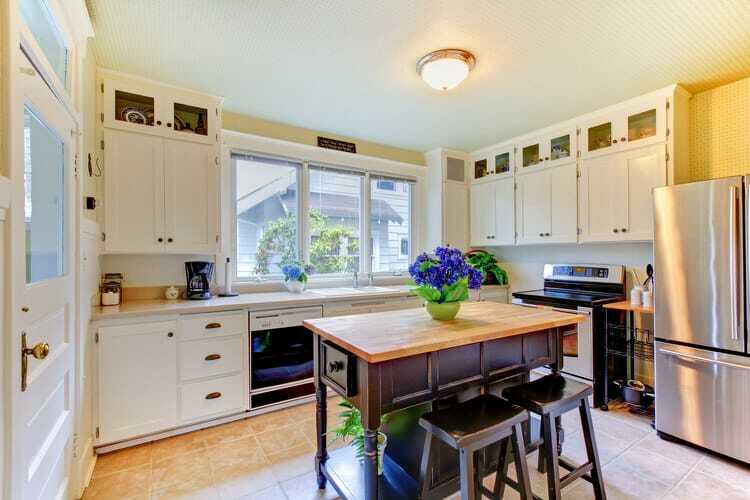 This Arts and Crafts kitchen is the perfect complement to this urban Seattle cottage. The simple flush-mounted light fixture puts out enough wattage to light the entire space. Vintage cabinetry gets revived with a good sanding and fresh coat of white paint. Upper cabinet fronts were removed and replaced with glass panels for visual interest. The readymade black island has a definite Craftsman air. The result is utterly charming. Beautiful kitchens can also be full of mischief. 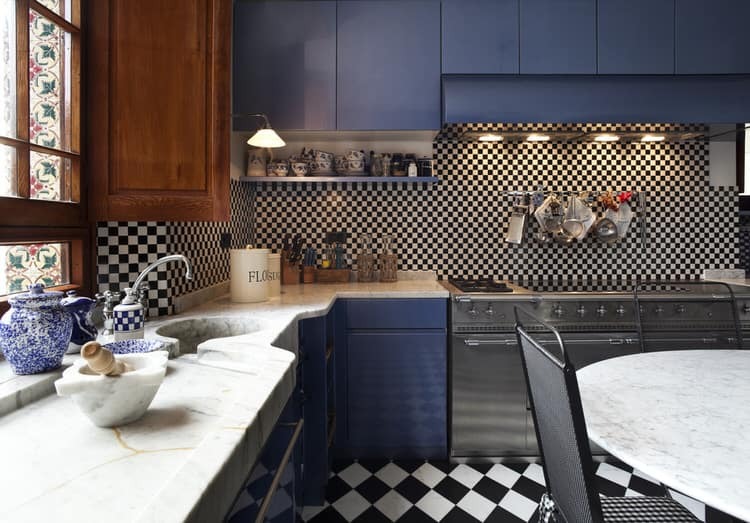 This one looks like it came straight out of Alice in Wonderland with its black-and-white checkerboard floor and backsplash. The pale blue table and decorative accents work swimmingly with the whimsical palette. The marble-topped table can be used for pastry making or hosting the Mad Hatter’s next tea party! 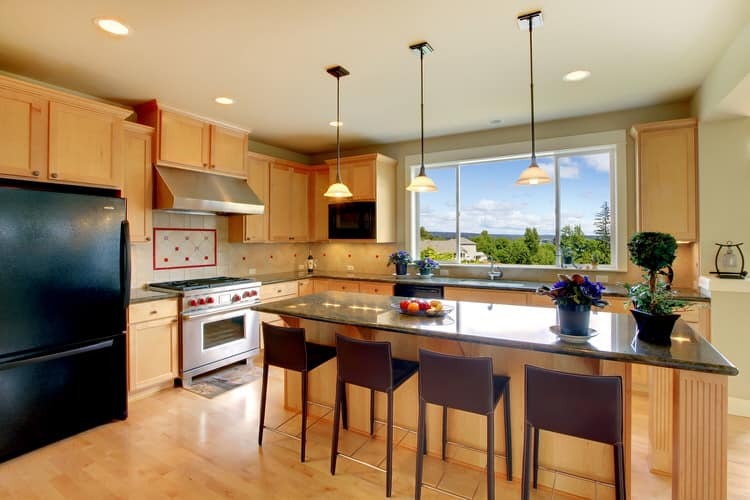 Keep your beautiful kitchen neat and elegant by using these simple design ideas. 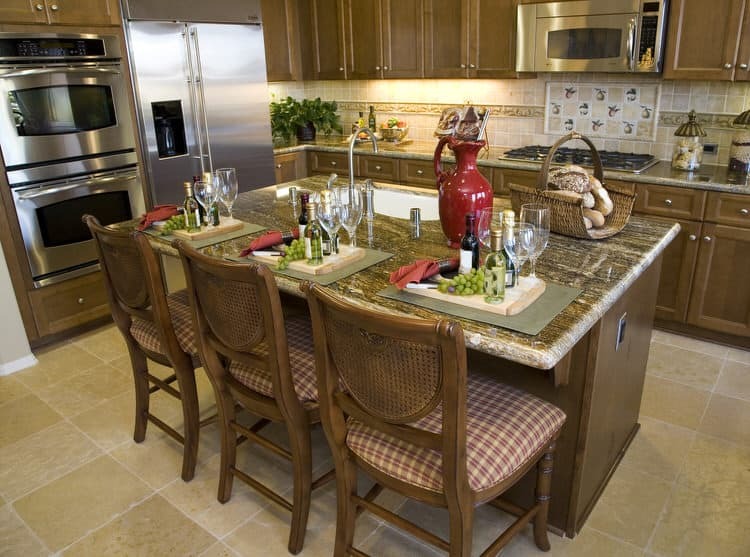 The rich colors of the granite and the natural finish of the wood cabinetry add warmth to this custom kitchen. The pair of wrought iron pendants over the island completes the look and gives the room a sense of age. Wire and wicker stools offer casual seating at the breakfast bar. Looking at the quilted stainless steel backsplash, you might think you stumbled into a 50s diner. At second glance, the space looks more like a modern commercial kitchen with its huge range and steel cabinetry. You can wash some pretty big pots in the deep, undermount sink and gooseneck faucet. Track lighting installed along a horizontal beam and an unexpected skylight will ensure you have more than enough task lighting for the tasks at hand. A Venetian plaster range hood is the focal point of the impeccable kitchen in this Bay area home. The designer has created a dramatic space for entertaining family and friends. 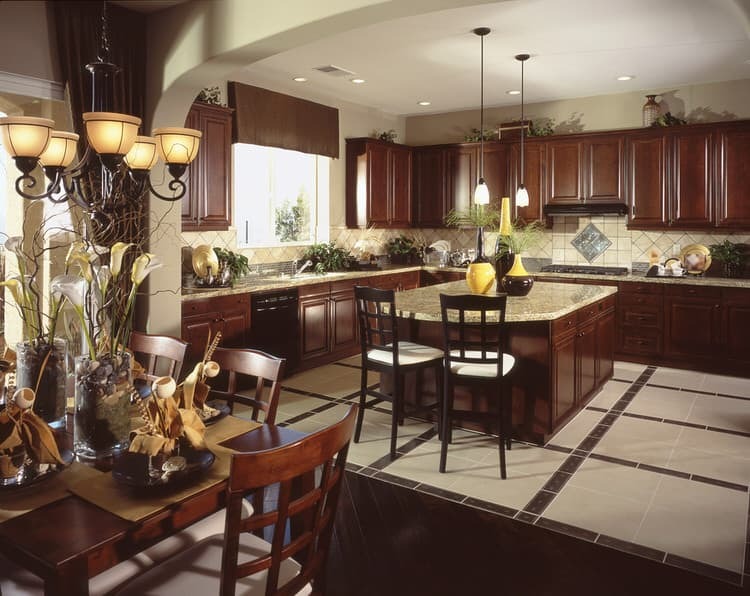 Cherry cabinets with raised panel doors give this kitchen a rich feel. 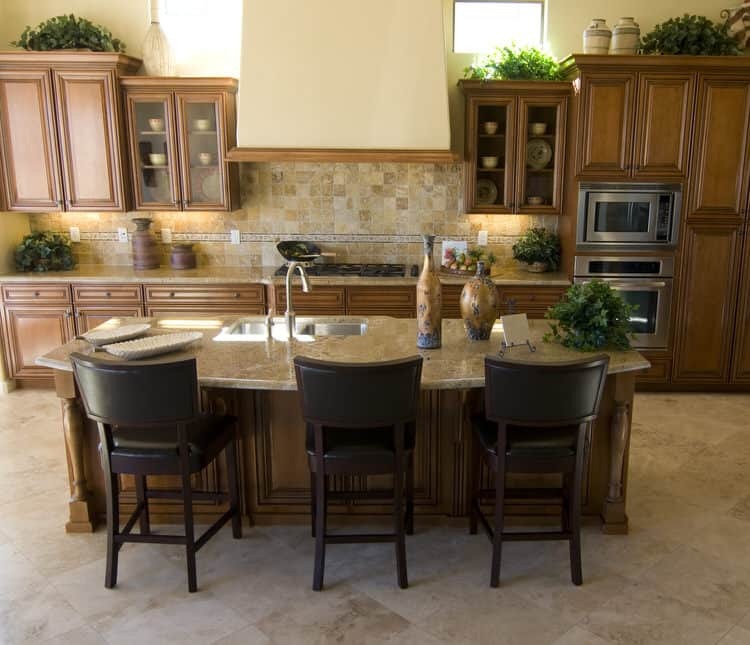 The generous use of imported granite and travertine gives this kitchen the ambience of a Tuscan villa. 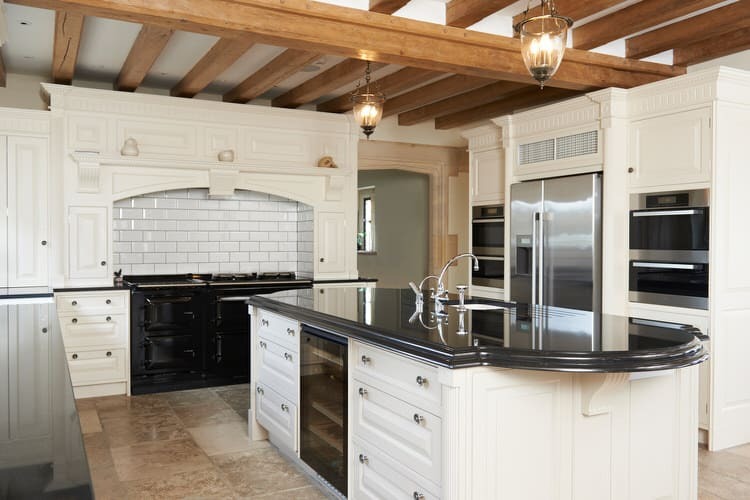 The massive black enamel range and arched range hood are flanked by white cabinetry. This mimics large fireplaces and chimney breasts common in Provençal kitchens. The black granite counter surfaces match that of the range, creating a sharp contrast with the bright, white subway tiles and custom woodwork. 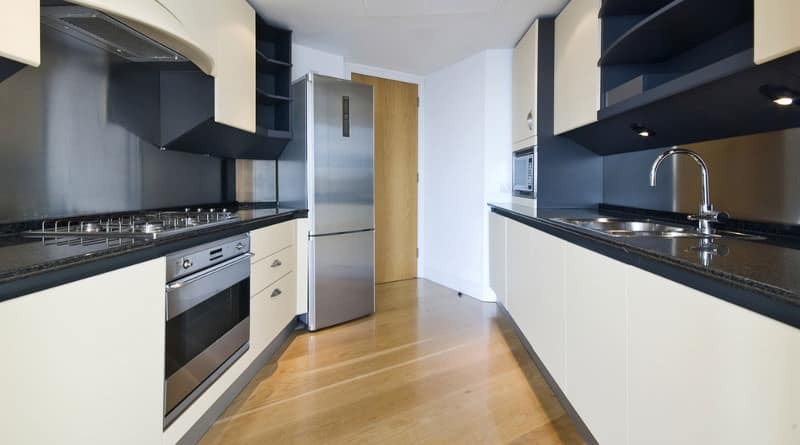 This chic studio apartment features one dynamite kitchen. Neutral reproduction linoleum flooring and gray walls help balance the visual intensity of the tomato red lacquer cabinets. There are no frills or ornamentation in this ultra-modern space. It’s just the facts ma’am with solid surface counters, sleek hardware and ubiquitous stainless steel appliances. Rustic cypress graces the ceiling of this weekend getaway. A lovely pastoral view is waiting for the lucky one who gets to do the after dinner dishes. While this kitchen look modest, the owners spared no expense with the reclaimed wood flooring and cabinetry from an old area schoolhouse. A local artisan crafted the countertops from concrete, adding a mocha stain and polishing to impart a high gloss finish. 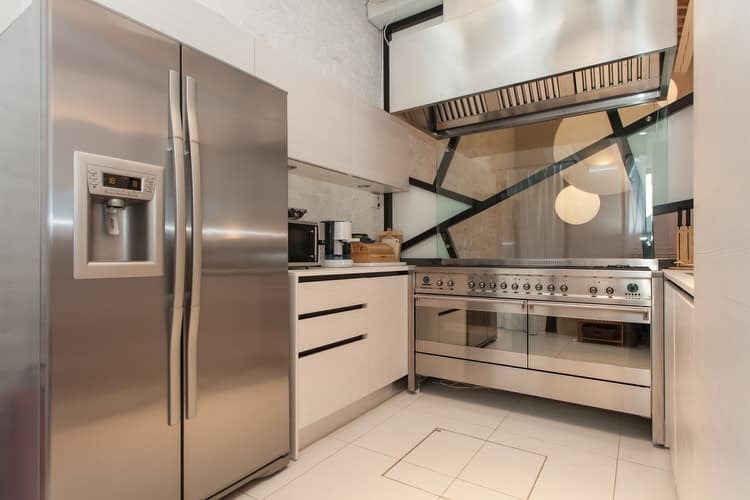 This kitchen looks like it might be a movie set from latest sci-fi thriller, but it’s actually a kitchen designed by a homeowner who is a huge fan of the genre. A band of toe kick lighting makes the cabinets appear to levitate. The eerie glow of undercounter and range hood lights could be the landing beams of a UFO. In this kitchen, the Oscar definitely goes to the lighting director! 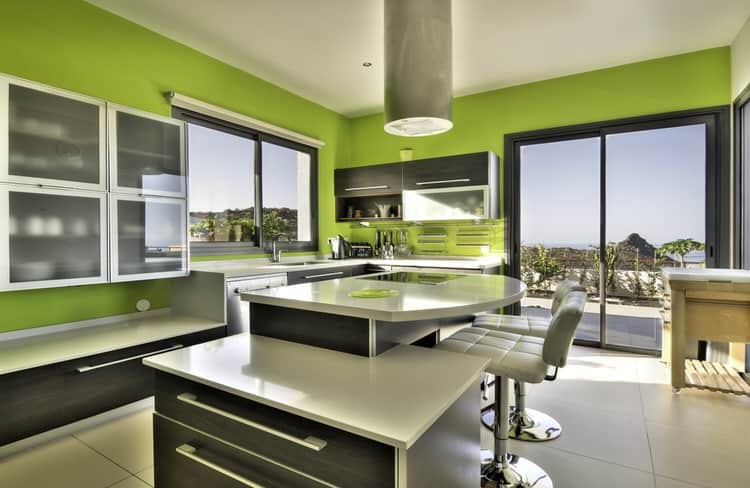 Electric lime walls give this spacious, modern kitchen a big, happy hug. To continue the cheery feel, the upper cabinets feature frosted glass fronts that give us a peek at the bright white dinnerware hiding just beyond. Chocolate laminate lower drawers are a flawless complement to the citrus green. And the two-tiered island with its bells and whistles could host a dinner party all on its own! 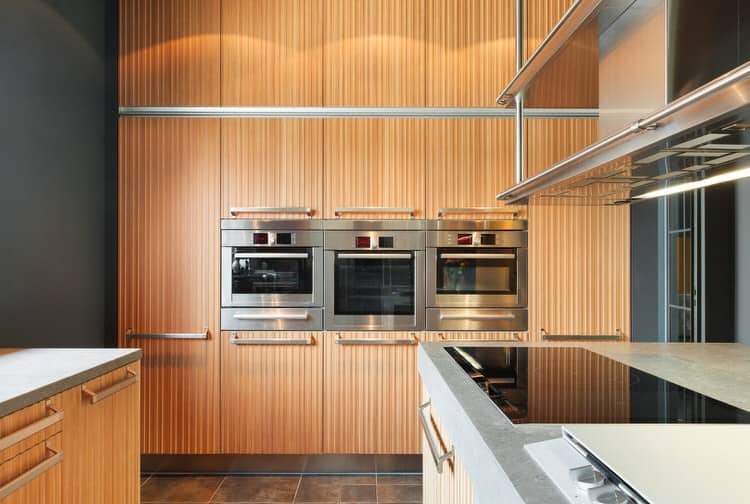 We’re blown away by the amazing floor-to-ceiling cabinetry, but what do you think about those wall ovens? For those born to entertain, double ovens would normally be enough to handle several dinner party recipes at the same time. Not to be outdone, this kitchen comes with a whopping triple oven configuration to make sure guests never run out of gourmet fare! While small in size, this kitchen is large in personality. The reflective backsplash behind the enormous twelve-burner range reminds one of a modernist painting with its bold lines and deliberate angles. The industrial strength range hood and extra-wide refrigerator are just the right elements for a kitchen that aims to impress. 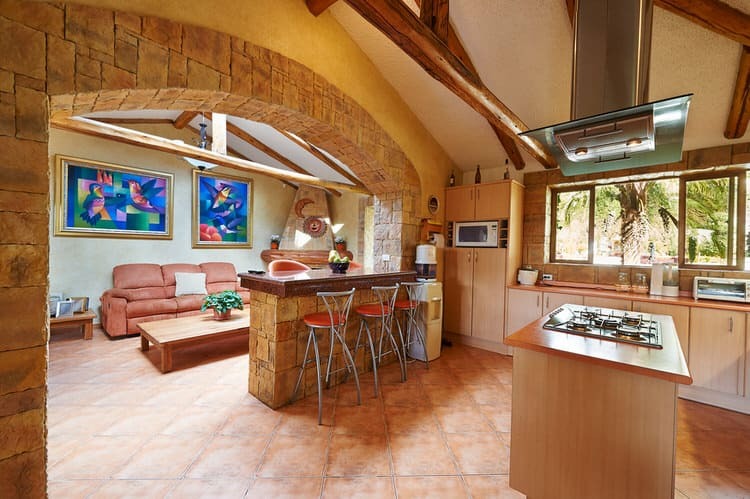 The vaulted ceiling and expansive arch add to the sense of space in this tropical kitchen. Exotic wood beams and stonework detail give the cooking space architectural presence and texture that flows with the rest of the home’s design. The key selling features of this penthouse apartment are the open floor plan and commanding views from every angle. 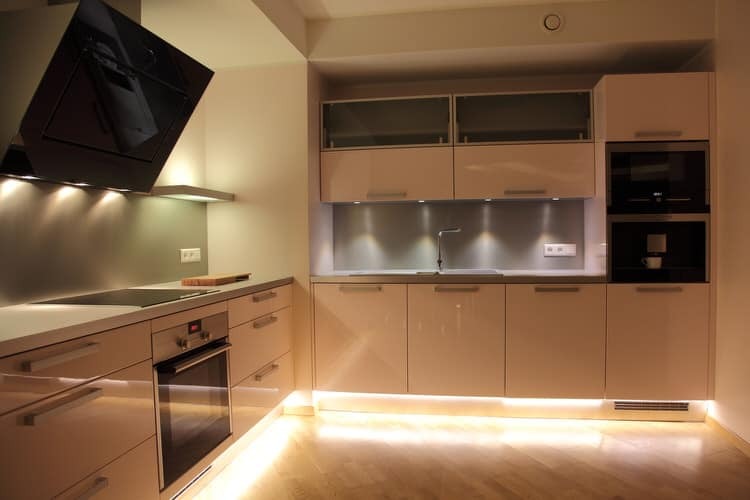 Can you imagine preparing dinner in this incredibly stylish kitchen as you gaze upon the twinkling lights of the city? 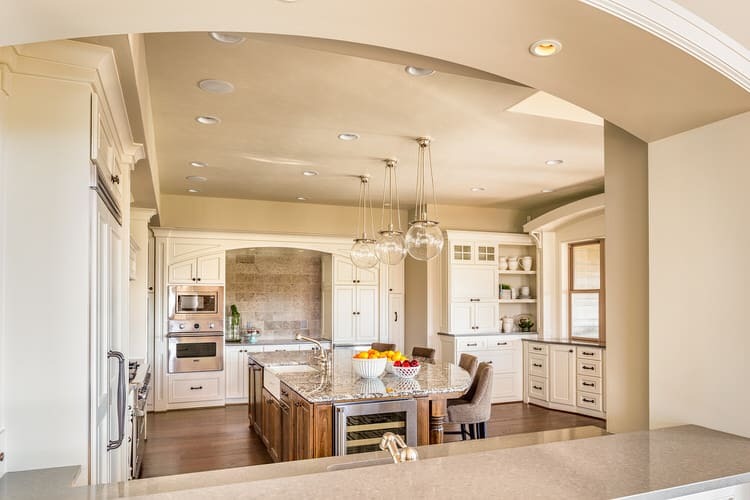 This kitchen boasts an extensive island and counter seating, state-of-the-art appliances and a drop panel ceiling housing recessed lighting and a custom pendant fixture. This is the quintessential country kitchen complete with a wallpaper border and images of farm animals encircling the space. 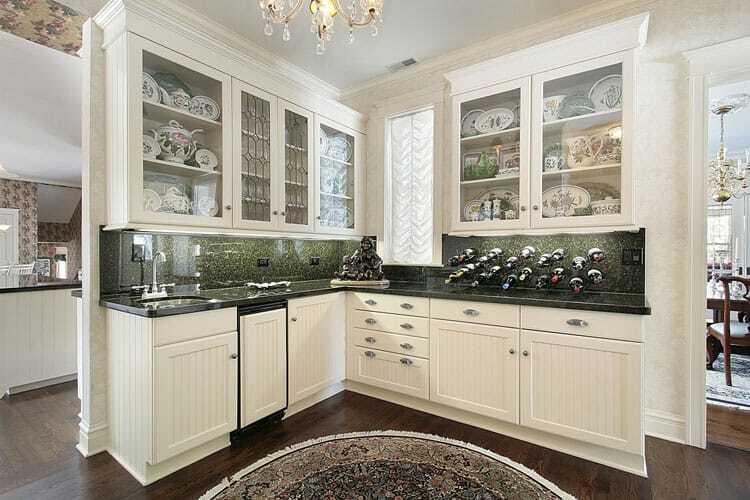 Pale green walls blend beautifully with the antique white cabinetry and island. The oak flooring and kitchen tabletop reinforce the country theme. The diminutive kitchen of this one-bedroom condo is proof positive that small footprints can be fitted for both style and function. Everything you could possibly need is in this space. This classic kitchen features a smart layout, luxe materials and a professional-grade appliance package to make spending time here a joy. These owners employed clever design ideas to seamlessly merge distinct kitchen, dining and family spaces into one cohesive room. The neutral palette of the open-concept kitchen becomes a space that makes it easy for the family to spend time together. It is perfect for work, relaxing and play time. 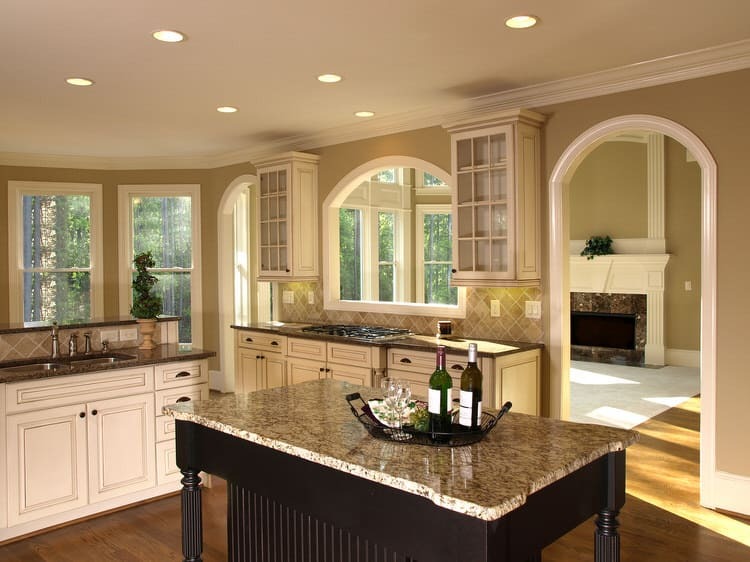 Classic arches are repeated throughout this kitchen to add architectural interest and allow for views into adjacent living spaces. Traditional elements abound in this dream kitchen, such as white raised panel cabinet fronts, rubbed bronze bin pulls, granite counters in two different tones, an island with turned legs and glass front upper storage. 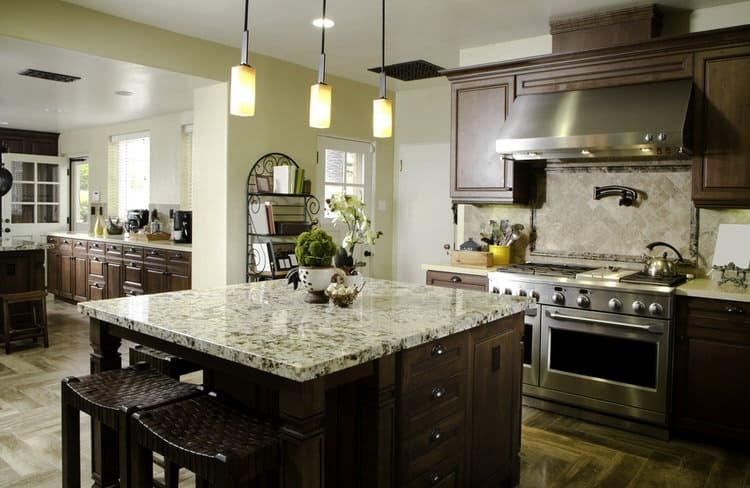 This chef’s delight features a square island that dominates the space while adding to its functionality. Sometimes square islands work better than rectangles. In this case, you gain pot storage with built-in drawers and gain seating on two sides of the island. 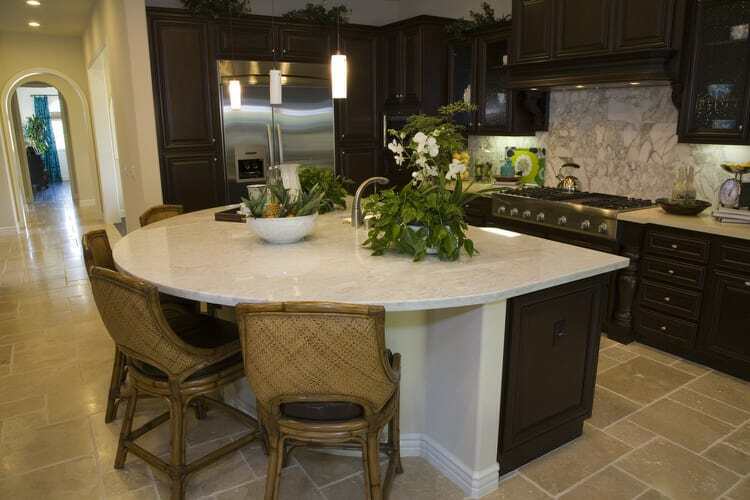 Consider installing a sink or cooktop in a square island to free up valuable counter space. This house once had separate kitchen and dining spaces. The new homeowners decided to modernize the space and create an open-concept kitchen. 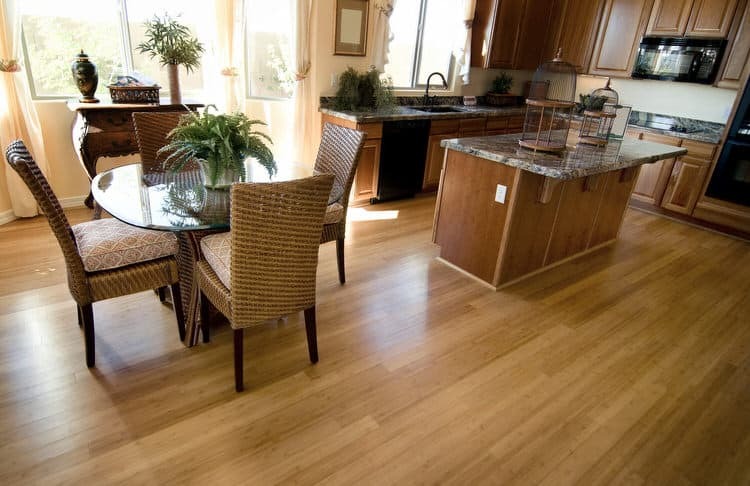 Bamboo flooring was an eco-friendly choice for this kitchen-dining combo. Keeping the flooring consistent throughout unifies the large space. All of the woodwork is similar in color and grain, which also supports the single space concept. Elegant and modern are fitting descriptors for this urban kitchen that looks out onto a rooftop garden. 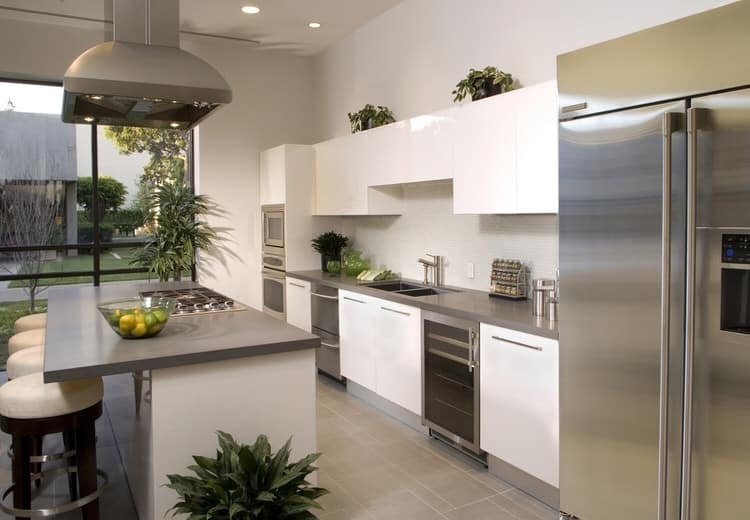 Sleek stainless is a natural match for glossy white cabinets and soapstone counters. 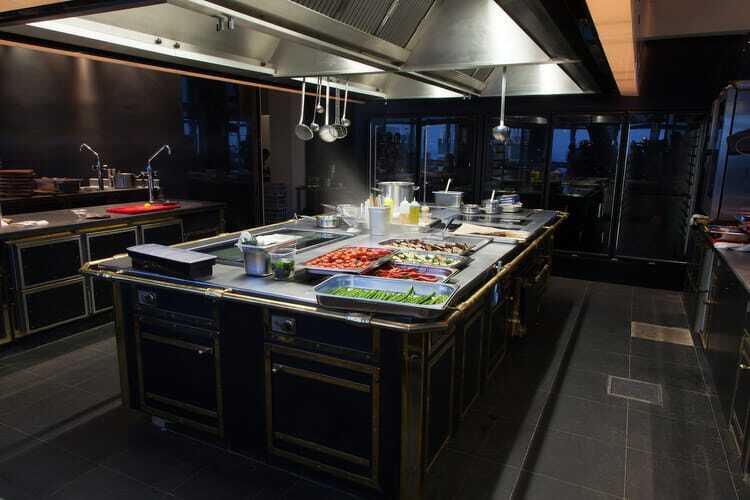 A commercial range hood is the crowning touch to a cook’s dream retreat. When this couple retired to the desert, they never imagine they would ever have such a beautiful kitchen. Luckily, they worked with a talented on-site designer to pick out just the right colors, finishes, appliances and furnishings to create a kitchen suitable for intimate dinners, bridge evenings and visits from the grandkids. 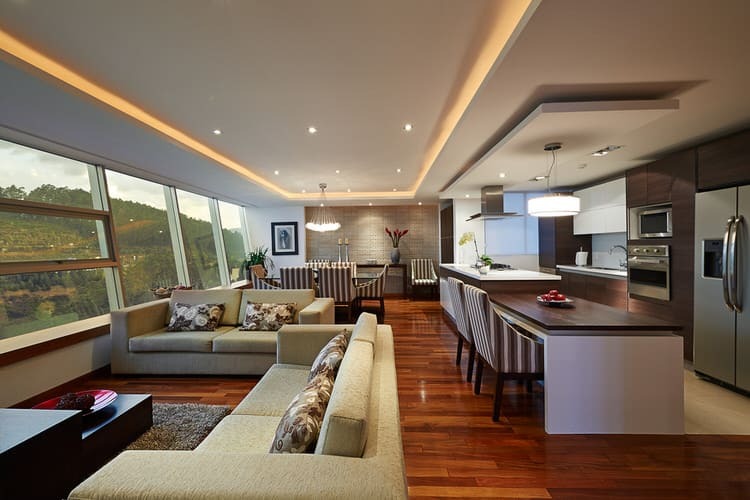 This kitchen design garnered a number of awards for its innovative space planning and stunning design. While this is an open-concept plan, the designer wanted to visually separate the spaces and did so by using different flooring materials for the kitchen and dining areas. 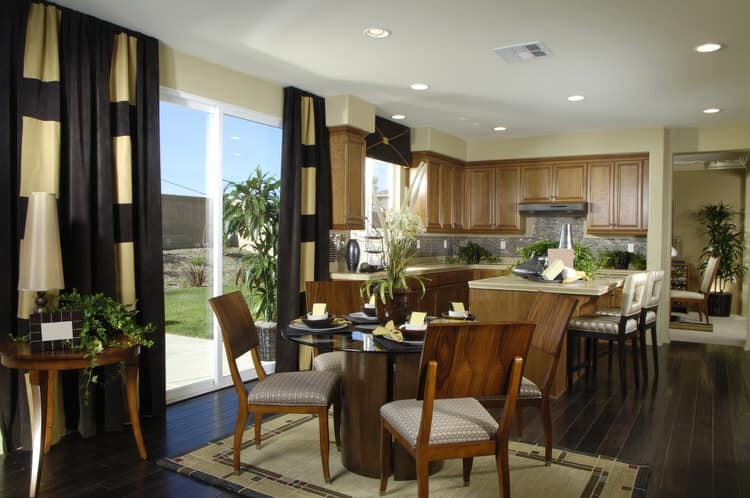 Dark hardwood in the dining area creates a dramatic contrast with the light kitchen flooring. Everything in this kitchen speaks to a clean, contemporary design aesthetic. A random-sized stone mosaic backsplash keeps the tones of the room neutral against the white cabinetry and island. A trio of backless stools tuck neatly under the island. 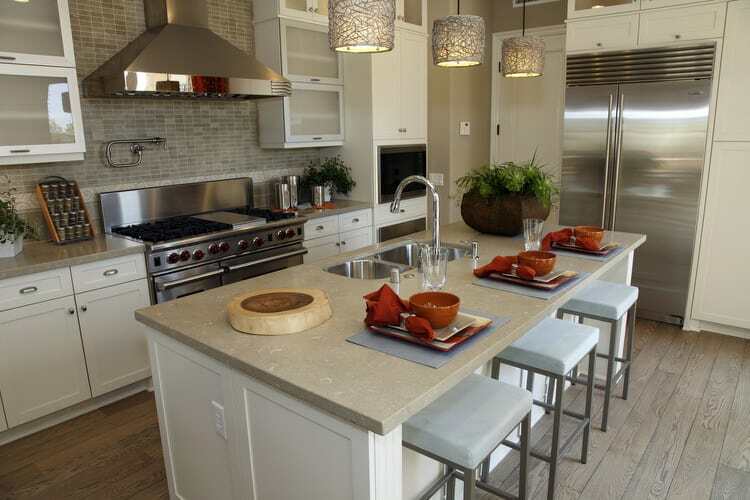 The stainless appliances add some glam as do the mini drum pendants. Don’t forget to check out the yummy ceramic wood grain floor tile in pale birch. 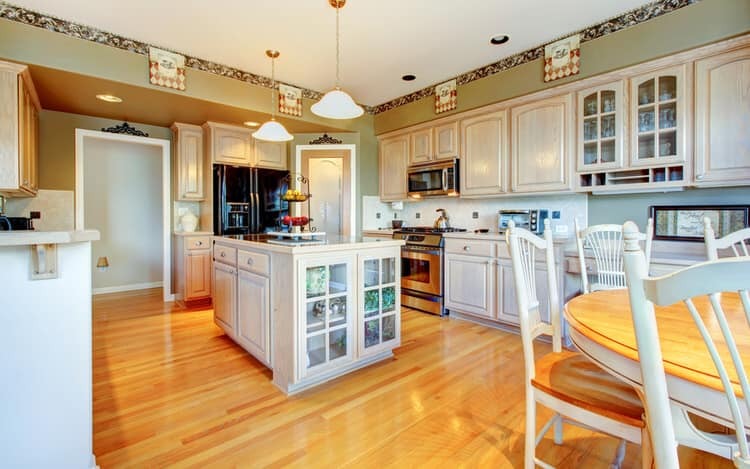 The super long island in this dream kitchen is a prep and storage area deluxe. 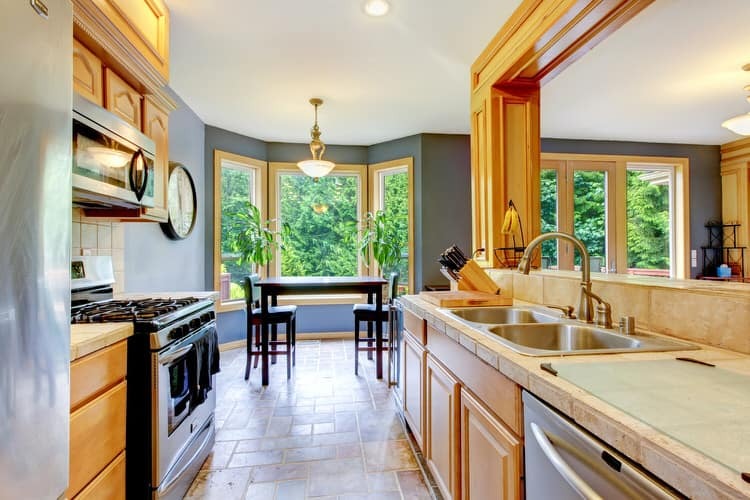 Even with plants accenting the far end, there’s still plenty of space to prepare a meal, house the microwave and provide loads of drawer and cabinet storage. Every kitchen should be so lucky to have an island like this. 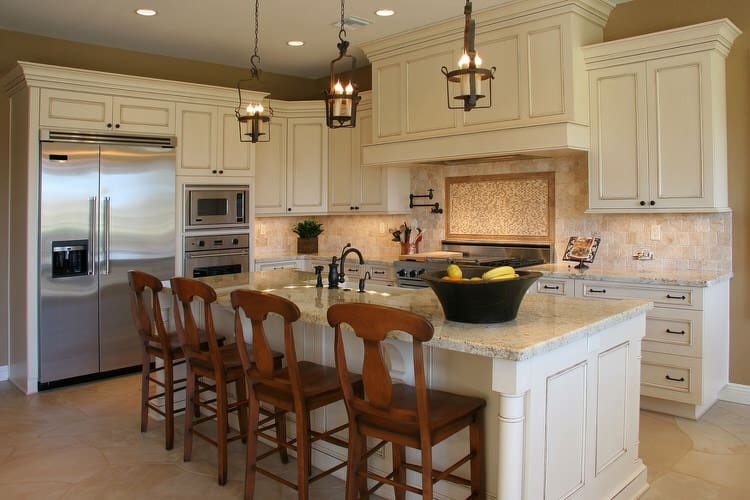 This transitional kitchen combines elements of both contemporary and traditional design. Sometimes described as eclectic, it uses a mix of elements, materials, textures and finishes. 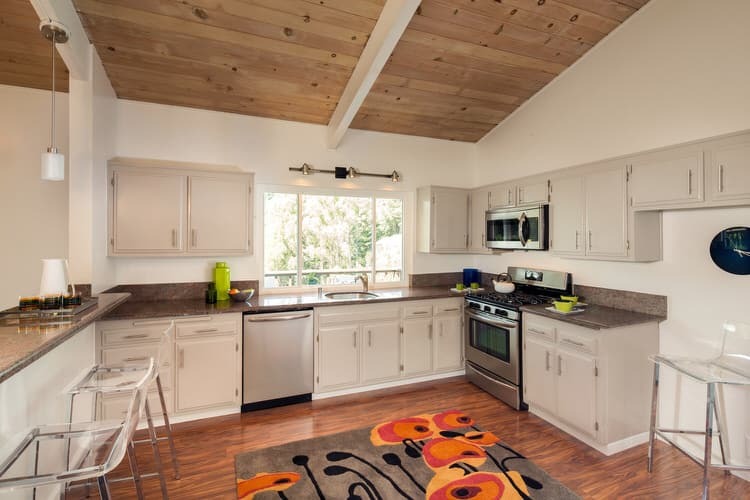 For example, our featured kitchen’s traditional cabinetry becomes transitional by pairing it with bamboo flooring and a stainless appliance package. Rustic country touches punctuate this richly-hued kitchen. 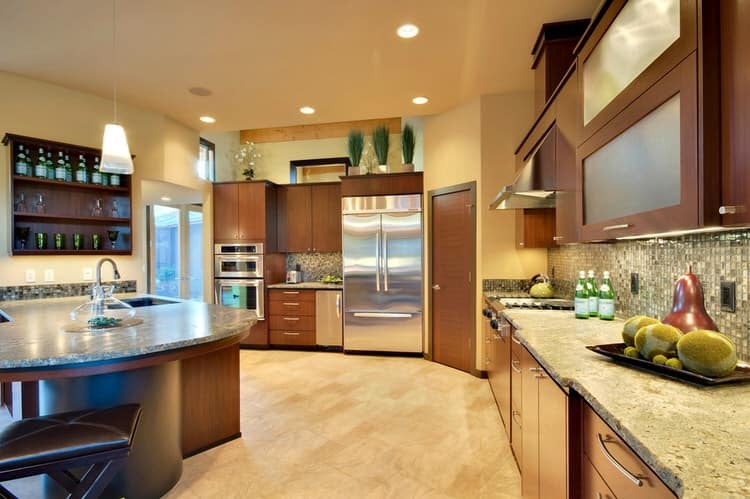 We really like the dark walnut cabinetry for a change of pace. 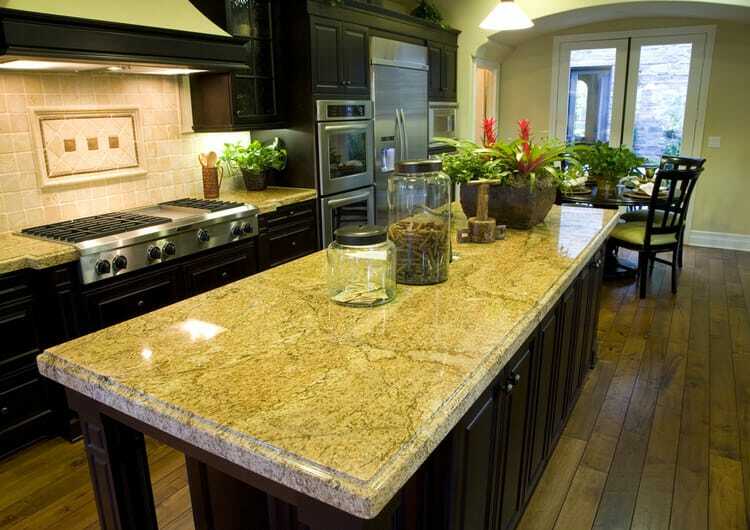 The choice of brown striated granite coordinates perfectly with the deep wood tone. Antique dining chairs reupholstered in cheerful cranberry gingham, pick up the colors in the floral accent tiles behind the rangetop. The kitchen in this home was made for entertaining. The pronounced curve of the island comfortably seats four guests and looks a bit like an old school cocktail lounge. While the chef dishes out the latest appetizer recipes, the resident bartender can dazzle with retro-inspired libations. This high-end kitchen is impressive from floor to ceiling. Obviously the first thing that catches your eye is the massive amount of cherry cabinetry throughout the space. This dark wood finish can be overwhelming. Luckily, the designer lightens things up with creamy, solid surface counters, travertine floor tiles and backsplash, and a pale pear paint color to play off the red tones of the wood.